Consumers continue to indicate that the availability of cash being the leading factor in choosing their Financial institution. The availability of convenient, surcharge free cash delivery can be a major factor in consumer satisfaction and growth. Our cash dispensing ATMs offer a fast, secure, reliable option for your customers obtain cash from their accounts at convenient locations. 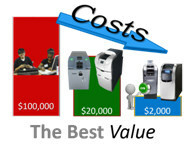 Adding cash dispense ATMs to your fleet can be a simple, cost-effective way to increase your footprint. The cash dispenser machines that we offer are designed to provide you with a simple cash delivery option that comes with a low Total cost of ownership. In some situations, we can even place these machines for free, eliminating the cost of purchasing a machine that you’re going to have to upgrade or replace in a few years anyway. The Cash Delivery devices available today and our current technology migrate the standard Cash Deliver ATM into a Marketing device. These devices that include custom graphic wraps and high definition user and advertising screens offer a great way to market your brand and offerings. That’s what makes us different when it comes to our ATMs. With our leasing option, including our managed services and transaction processing, there is a chance, depending on the number of transactions processed through your machine, that we will be paying YOU money every month. We have options in different sizes, stand-alone, through the wall, indoor and outdoor to meet your needs. For more information about buying or leasing a cash dispensing ATM, contact us today. Our Cash Management solutions are among the most extensive in the Financial institution industry. We include the complete cycle of cash beginning with the secure transportation of cash from the Federal Reserve to your Branch\ Technology to advanced consumer transactions. We use the latest in Teller Cash recycling technology reducing the risk of counterfeit or miscounted funds and reducing the time spent counting and recounting cash. Our cash management technology enables Financial institutions to focus on consumer service and not on constantly managing cash. We begin with cash forecasting making sure only the assets required are used to ensure the availability of cash. Our integration makes the functionality of teller cash recycling technology seamless. Our delivery of cash management solutions is industry leading. We are the only solutions provider that offers an end to end solution for cash management. We include a range of Teller Cash Recycling solutions to meet any need or function including our Enhanced Capacity vault solution, high capacity transaction deliver and self service solutions. The value of our cash management solutions begins with the dramatic reduction in traditional cost of managing cash. Considering that each note entering a Branch is counted at least 6 times the labor costs are high. Our integration and management removes the need for upfront purchase and reoccurring management costs. We deliver in a transaction delivery fee model at low monthly rate.